Photo by Andrew Hurlbut of Bernie Worrell ’67 performing at an NEC “Jazz40” concert at B.B. King’s in New York, March 2010. 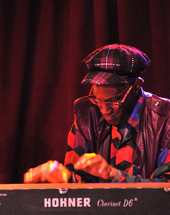 Keyboardist, composer, and producer Bernie Worrell is one of the most prolific funk and R&B artists to date. As a founding member of the ‘70s & ‘80s funk band Parliament/Funkadelic, Worrell’s work with the synthesizer was what gave the band its futuristic sound, and furthermore made the band a highly influential player in the world of R&B. In the 1980s, Worrell frequently played with the rock band Talking Heads, both on the road and in the studio. After leaving Talking Heads, he was a studio musician for countless celebrated artists and groups, such as Keith Richards, the Pretenders, Jack Bruce, and Bootsy’s New Rubber Band. Worrell has also released numerous critically acclaimed solo albums, and was inducted into the Rock and Roll Hall of Fame in 1997. He is currently a member of both the Bernie Worrell Orchestra and Colonel Claypool’s Bucket of Bernie Brains. Worrell is a classically trained pianist, having taken private lessons at Juilliard and pursued college studies at NEC through 1967.